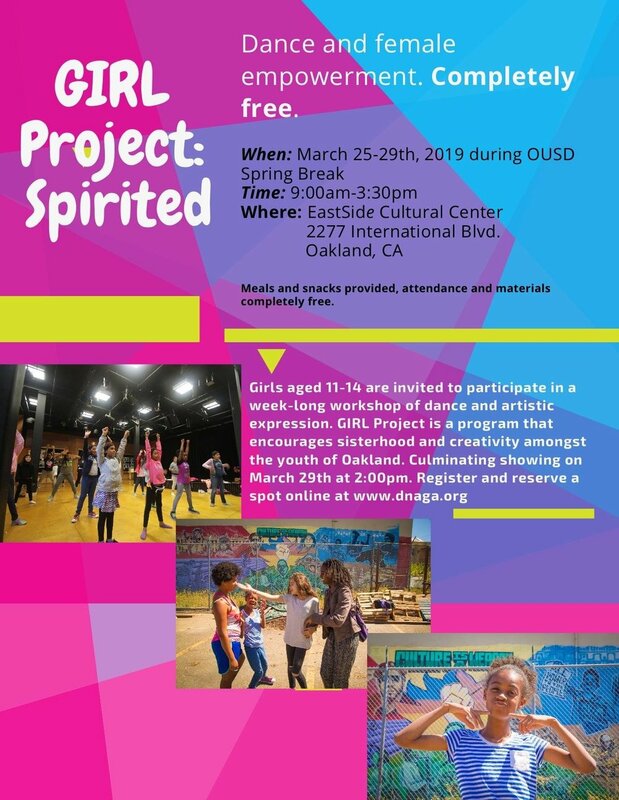 GIRL Project is a free week-long dance and empowerment workshop that serves middle school aged girls ages 11-14. Our focus is on girls living in Oakland’s San Antonio District, as well as the greater Oakland area. The goal of GIRL Project is to facilitate a safe space for girls that will promote healthy relationships, self-worth, and healing through dance and artistic expression. The workshop sessions take place March 25-29th at the EastSide Arts Alliance and Cultural Center during OUSD’s spring vacation from 9am to 3pm every weekday, with a culminating community meal and performances at the end of the session to give the kids a chance to present their work to their friends and families. A vital part of our workshop being a success is providing three free meals a day for the girls, as well as school supplies, dance gear, and more. In order to make our program accessible to as many of our young community members as possible, we make sure that everything is completely FREE.